Jim Belilove, owner of Creative Edge Master Shop, and I often talk about business; his is in a very precise business with no flexibility for error .Architectural water jet is a very detailed business; you are literally taking computer generated photos and turning them into magnificent stone art for the walls and floors. It takes lots of good ideas to make this work. He also has a 10-1 theory about how things work. We were discussing how many ideas you need to have before you have a viable one. Jim’s 10-1 theory is very useful and can be helpful for all types of decision making including the design of architectural water jet projects. How does it come to 1 out of 10? I asked. What will the project cost to build and what is the final cost to the customer? The price consists of many things below and must be included when quoting a customer. The project must be paid for before it’s delivered. Projects that often look the same are always different. Having done something similar once before doesn’t guarantee the present cost. Product prices and labor costs always change. Can you get the project competed in a timely manner? One that will help you bring it under or close to the cost you anticipate? Can I get all of the products I need in a timely manner? Is everything available? Can I get the project to the customer within their time frame? Is it realistic? Will the materials work together? Sometimes things occur which we haven’t anticipated, i.e. a reaction between the glue and setting materials. How flexible is the customer? Sometimes a customer is too difficult to work with and becomes a problem from the start. It’s better to walk away early. How will the project be shipped and who will be there to receive it? We’ve done this so many times that we are very cautious about this and how it’s done. Installation of the product. This is another critical factor. In fact it’s often important to get this information on the front end. These products must go to real artisans that understand what materials they are working with and do things by the book. Try and see things clearly. No matter how exciting we must try and see them clearly and not skip the crucial steps or think we can somehow make an excuse for one of them. No matter what, we must continue to come up with ideas; it’s what gives the world its uniqueness. 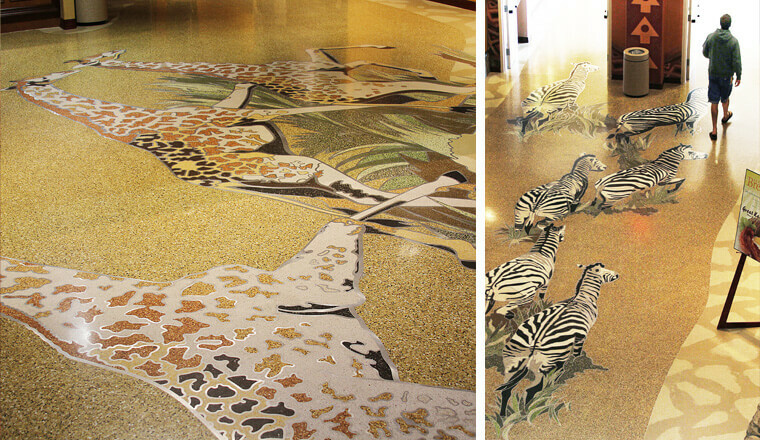 To connect with Jim Belilove at Creative Edge Master Shop: @ jimb@cec-waterjet.com, 641-472-8145 ext.101, CST. Lisbeth is one of the original founders of Fabulous Floors Magazine and has been a business consultant in the industry for over 20 years. Reach her at Lcalandrino@nycap.rr.com. This entry was posted in Uncategorized and tagged Architectural Water jet, Creative Edge Mastership by fabulousfloorsmagazine. Bookmark the permalink.